When it comes to inheritance, you’re getting more than just DNA. Life experiences – famine, stress, fear and even drug use – can all leave chemical marks on a person’s genetic material. This is often referred to as epigenetic (“above genetics”) modifications. Although these chemical add-ons don’t directly change the genetic code, they do alter the way genes are expressed and thus help drive long-lasting changes in brain function and behaviour. Incredibly, these changes can be handed down through generations: the children of holocaust survivors with PTSD show lower cortisol levels; mothers who suffered child abuse themselves give birth to children with higher anxiety levels. Neuroscientists are only beginning to unravel why this is the case. Early evidence suggest nurture is key. After all, a mother's mental state will greatly affect how she treats her children. And scientists have found that well-loved rat pups show distinctive epigenetic modifications compared with neglected pups. Yet a few fascinating studies now suggest that it's not just nurture. Like DNA, epigenetic information can also be inherited, and tantalizing evidence suggests that they may directly impact specific behaviours in subsequent generations. How is this possible? An obvious answer is that epigenetic modifications to parental DNA are passed on to their offspring. However, as the embryo develops most (if not all) chemical modifications are erased, making the hypothesis rather unlikely (although some think this is possible). A more probable mechanism points to diffusible messengers in the sperm or egg as bearers of transgenerational epigenetic information. These molecules float around in the soluble portion of cells; when sperm meets egg, they effectively tag along and enter the fertilized embryo, where they can stealthily impact development. One potential candidate is small non-coding RNA, a type of RNA molecule that doesn’t encode proteins themselves but instead regulate gene expression. These molecules were previously implicated in epigenetic inheritance in worms, but whether they function similarly in mammals is up for debate. Researchers from Switzerland wanted to see if small RNAs in sperm cells link environmental stimuli to gene expression across generations. Traumatic events in early life are known to cause behavioural changes that persist to adulthood, so researchers induced stress in infant male mice by unpredictably removing their mothers at random intervals. The trick worked: these mice (“F1”) became daredevils, venturing into naturally dangerous territories like elevated (graph a) or brightly lit (graph b) spaces. They also showed signs of depression, giving in faster to the threat of drowning when placed into a glass cylinder filled with water (graph c). Notably, when researchers mated them to non-stressed females, these traits were passed on to their offspring (designated “F2” in genetics). Compared to controls (white bar), MSUS (traumatized, black bar) mice are faster to enter elevated spaces (a) and spend more time in naturally aversive bright spaces (b). They also spend more time floating, rather than struggling in water (c). The traumatized males also had trouble regulating their blood sugar levels, which was further amplified in their non-stressed progeny. However, the data here is somewhat messy. The researchers looked at baseline blood sugar and insulin levels, then used two tests - tolerance to external glucose and blood sugar response to insulin - to see how the two generations responded. Although both the traumatized mice and their progenies showed wacky blood sugar regulation at baseline and after the challenges, the effects were not consistent between the two generations (for example, baseline insulin levels were normal in traumatized fathers but lower in their progeny). Compared to mice sired from controls, these F2 mice showed lower body weight despite higher caloric intake, suggesting an amped-up metabolism. Remember, the pups of traumatized males were never stressed themselves, so somehow their father's trauma had influenced their metabolism. But since the effects vary, whether this trait is through direct inheritance is still up in the air. To see if RNAs were behind these changes, researchers extracted small RNAs from the sperm, blood and brain of traumatized males and compared them to that from controls. Early life trauma dramatically altered several types of small RNAs: some populations were produced in excess, while others were lower in the corresponding tissue compared to controls (see graph below). Unfortunately, save for one (perhaps picked out for its involvement in metabolism), the authors did not discuss what these small RNAs do, so it's impossible to understand the implications of these changes. It's also notable that for a particular small RNA, the direction and size effect of the changes were not consistent between tissues - in other words, the data is a bit all over the place. In their progenies (F2), researchers saw a similar (though not identical) pattern of small RNA alteration in the hippocampus and blood; however, no detectable differences were seen in their sperm. 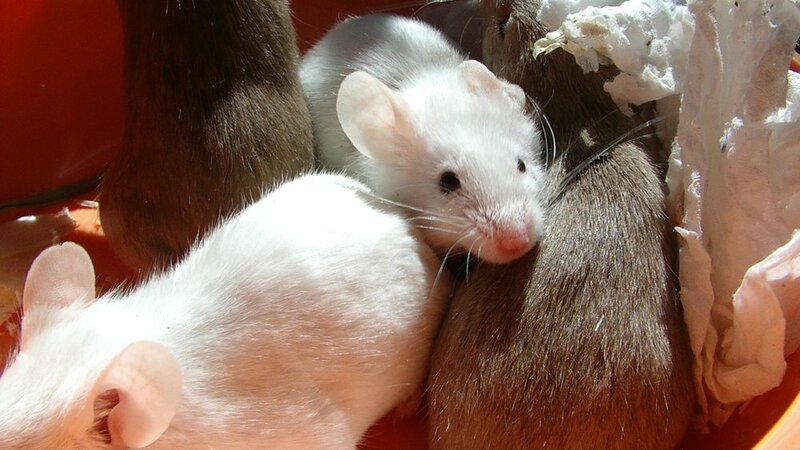 Correspondingly, the grandchildren (F3) of traumatized mice also showed normal small RNA expression patterns. This is pretty strange, as previous studies showed that trauma is passed on to the third generation. So if small RNAs are involved in epigenetic inheritance, it seems that other messengers are also at play. Although interesting, the above experiments can only show a correlation between imbalanced sperm RNA and progeny behaviour. To drive their idea home, the researchers went on to prove causality with a clever experiment: first, they mated non-stressed control mice and obtained normal fertilized egg cells. They then extracted RNA purified from the sperm of traumatized male mice, and directly injected them into the fertilized eggs. Remarkably, mice developed from these RNA-injected eggs showed the same depressed-like behaviour and metabolic changes as mice sired from traumatized fathers through copulation. (What's interesting though is that the behavioural data was tucked away in the supplementary figures...) Taken together, the authors conclude that small RNAs in the sperm act as a molecular middleman to link parental life experiences to gene expression and behaviour of their progenies. Although quite exciting, the data is somewhat thin and the study leaves many questions. For one, we don’t know how trauma leads to the dysregulation of small RNAs, but it’s likely that stress hormones are involved. We also don’t know how microinjected RNAs are acting on gene expression (only that they do), and which genes they regulate. Finally, why do RNA alterations disappear after two generations (F2) when behavioural changes persist for at least one more (F3)? The researchers speculate that such a biological mechanism may have evolutionary advantages. After all, if the father suffered from stress, changes in his sperm RNAs could prime his children to be more prepared for a stressful environment. The team is now collaborating with clinicians to see if small RNAs also mediate trauma inheritance in humans. If so, we may be able to eventually develop a blood screen for those susceptible to traumatic stress.